The popular 112 Westport model offers contemporary styling balanced with timeless, traditional appeal. DREAM WEAVER keynotes a vessel of extraordinary performance, built to uncompromising standards of structural integrity and quality. The 2006 model Westport is loaded with upgrades and features an exceptional design layout, maximizing space for entertaining guests. Her four stateroom layout sleeps 8 guests comfortably and includes a full beam master, Queen VIP and 2 additional guest staterooms. DREAM WEAVER’S wide beam creates an open and expansive main salon and formal dining room. The opulent interior is accented with custom carpet, Cherry woods and granite throughout. DREAM WEAVER’S exterior deck spaces feature a spa Jacuzzi, al fresco dining areas, wet bar with ample seating and lounging areas for all your guests. DREAM WEAVER's wide 23' 6" (7.16m) beam creates an open and spacious salon with expansive windows furthering unobstructed views for owner and guest. Formal dining area allows seating for 8 guests. Comfortable and broad staterooms include a full beam Master with a separate entrance for his and her ensuite as well as VIP with queen bed, port guest stateroom and starboard Twin accommodations. 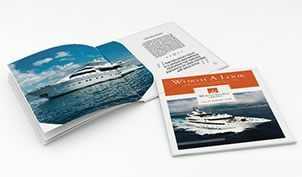 The Westport 112 provides an exceptional design layout for onboard operations and crew services. Sinks: Undercounter type Kohler china bowls. Bates & Bates sink in fwd guest SR. Captain & crew sinks are Bolero stainless steel. Doors, drawers, trim, dressers, nightstands, vanities, are all Cherry veneer w/acrylic polyurethane finish in a satin sheen. Doors have locksets, furniture has Actron latches. Salon bar is a walk-up bar with U-line combo refrigerator/icemaker, mirror polished round sink, chrome faucet and storage. Edgester 30-bottle/wine cooler. Cast urethane foil shape rudders w/ss stocks 7.6 sq.ft. Shore power: (1) 100 amp receptacle in aft deck & (1) 100 amp Glendenning reel is portside aft in Laz area. 42' drop down Panasonic flat Screen TV, Integra A/V Receiver with Dolby 5.1 Surround Sound, Integra 5 Disc DC/DVDPlayer and SpeakerCraft CRS 8.2 speakers. Exclusions to include but not limited to, owners' and crews' personal belongings. If requested, a list will be provided at closing.